The cultural foundations of Japan are intimately linked to continental Asia. China and Korea in particular helped shape the early Japanese states in many ways, over centuries of immigration and cultural exchange. The introduction of rice agriculture, the Chinese writing system, and the Chinese system of bureaucratic imperial government are perhaps the most well-known examples, but the influence of mainland cultures on the Japanese archipelago was pervasive. Although there are many works covering important dates and discussing how various cultural and other elements entered Japan, until now there has never been a comprehensive study of how the Japanese (the "Wo") were viewed by the Chinese in ancient times. 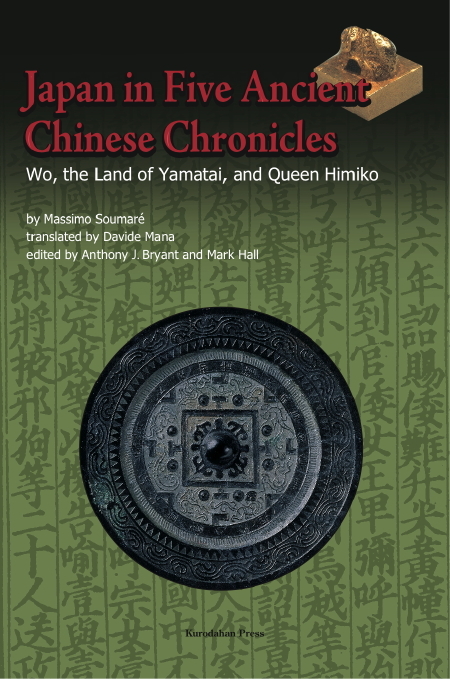 Independent Italian scholar Massimo Soumaré corrects this imbalance with Japan in Five Ancient Chinese Chronicles. Cover: Bronze mirror from Hirabaru, Fukuoka pref., property of Agency for Cultural Affairs, and gold seal from Shikanoshima, Fukuoka pref., property of the Fukuoka City Museum. (Born in Turin, Italy, 1968) Translator, author, freelance researcher and essayist, with an interest in diverse facets of Japanese culture, he has focused on promoting a deeper and wider cultural exchange between East and West. His work touches not only literature and history, but also language and dialect, traditional stage entertainment and recent phenomena in Japanese society and pop culture. He has translated into Italian a number of works by modern writers such as Dazai Osamu, Miyazawa Kenji, Yamamura Bochō and Yumeno Kyūsaku, and by contemporary authors such as Asamatsu Ken, Bandō Masako, Kikuchi Hideyuki, Onda Riku and Sena Hideaki. In 2004 he edited the poetry anthology Come vena d'acqua, published by Edizioni Empìria, the first complete and uncut collection of the works of Nakahara Chūya and Tachihara Michizō, standard-bearers of the Shintaishi, the "new form" of Japanese poetry. He was also the editor of A Oriente! (La Babele del Levante, Milano, 2002), the first bilingual Italian-Japanese magazine. He routinely collaborates with Italian journals dealing with East Asian culture such as Quaderni Asiatici (Centro di Cultura Italia-Asia "G. Scalise", Milano) and with literary magazines such as LN-LibriNuovi (CS_libri, Torino) and Studi Lovecraftiani (Dagon Press, Pineto). He is the author of the modern literature entries for the Nova, Grande Dizionario Enciclopedico encyclopaedia, published by UTET (Torino, 2001, reprinted in 2003 as L'Enciclopedia, La Repubblica, Roma). He was the editor for a series of interviews on Kamigata rakugo, a monologue-based form of traditional entertainment, and has moderated a series of debates between Italian and Japanese authors. Resident consultant and translator for the Turin Chamber of Commerce, he holds several courses in Japanese language and culture (CentrOriente di Torino, the Fondazione Università Popolare di Torino and the Associazione Interculturale Italia-Giappone SAKURA). As an author of fiction his short stories have been published in various anthologies, including the Fata Morgana (CS_libri, Torino) and Alia (CS_libri, Torino) series. Davide Mana (born in Turin, Italy, 1967) is a freelance paleontologist specializing in statistical analysis of dead populations and the application of new technologies to the study of the past, and has a few nationally and internationally-published papers to his credit (and a few boxes of fossils he dug out himself) to show he's for real. Starting in 2001, he has been lecturing on the subject of paleontology and teaching practical statistics to environmental sciences post-docs for a five years, becoming in 2006 the coordinator and main instructor for the International School of Advanced Environmental Statistics in the University of Urbino Carlo Bo, the only statistics course in the world to feature a field trip. In the meantime, he has been leading a second life: a certified bilingual and a committed anglophile with a love for history and literature, he has been working as a translator of both scientific and literary texts for over a decade, including a four-years gig as editor for the four volumes of the Italian anthology of international fiction Alia (CS_libri, 2003-2006). His short stories and non-paleontological essays have been published in magazines and in book collections in Italy, the UK, the USA, France and Japan, and variously circulated through the web. Apart from his fossil-related research work, he is currently reviewing science and history books and maintaining the column “A Natural History of Fantasy Fiction” in the Turin-based literary magazine LibriNuovi (CS_libri), putting his finishing touches on his first book (about dinosaurs and popular culture), revamping his Urbino course for better performance and generally causing more embarrassment among his fellow bone-hunters in academia. Anthony J. Bryant is a historian and freelance translator of Japanese. He is a former magazine and newspaper editor, and holds a Master's Degree in Japanese from Indiana University. He has a particular interest in warrior and court culture in premodern Japan. In addition, he has done consultation work with the BBC and other production companies for television documentaries. His website is sengokudaimyo.com. Mark Hall was a post-doctoral scholar with UNESCO's Silk Roads project, and after that a two-year post-doctoral scholar at the National Museum of Japanese History in Sakura, Japan. From 2000 to 2003, he was a curator of archaeology at the Niigata Prefectural Museum of History. He is now employed at the Hearst Museum of Anthropology at the University of California at Berkeley. His research focuses on the prehistory and early history of Northeast Asia, and analytical studies of prehistoric pottery and metalwork.